Frequently Asked Questions- Click here to access the Hotel FAQ Document, which includes the list of hotels and rates. TCT Meetings Hotel Map - Click here to access the map of all TCT Meetings hotels and their distances from the Convention Centers. Housing Fraud - Please be aware of any company reaching out to you via email or phone that is not ConferenceDirect. The only housing company authorized by the 2019 TCT Meetings of ASBMT & CIBMTR is ConferenceDirect and unless requested by you, ConferenceDirect will not contact you directly. If you are contacted by a third party company, please do not provide them with any personal information and contact the 2019 TCT Meetings of ASBMT & CIBMTR Office at TCTMeetings@mcw.edu. Please note that you must register for the meeting before booking your hotel room. Due to demand, we have a limited number of rooms available within the 2019 TCT Meetings of ASBMT & CIBMTR. However, by clicking on the link provided after you register, you will be able to view available hotels within and outside of our block that fit your check in/out dates. If you have already made your hotel reservation and wish to modify, please click here and enter your acknowledgement number and last name. Courtyard Houston Downtown is a beautifully historic hotel that still has its original, neo-classical style with polished rose marble and brass elevator doors. The hotel is in a prime location, putting you in the pulse of the city within walking distance of the George R. Brown Convention Center, Toyota Center and House of Blues. The MetroRAIL is conveniently located right outside the hotel to take you even further. The Marriott Marquis Houston is located in the vibrant downtown district and connected by skywalk to the George R. Brown Convention Center. 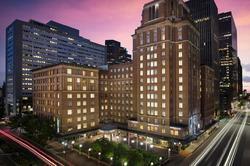 The hotel overlooks Discovery Green Park and is just minutes from Minute Maid Park and the Toyota Center. Explore the 150,000 square feet of premier event space, including a Texas-sized ballroom, meeting rooms, a rooftop terrace and outdoor pavilion.